The lavishly illustrated pages of this beautiful volume capture the world of the mighty pharaohs, great pyramids, and magnificent temples, as well as showing the charm and beauty of contemporary Egypt. 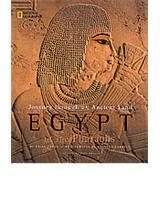 Through an authoritative and fascinating text, the reader is taken on an unforgettable journey through the history of ancient Egypt, carried along by the lively historical narrative that ties together the vast panoramic sweep of Egyptian history and the most compelling stories of the pharaohs and their accomplishments. Stunning photographs capture the breathtaking grandeur of the Valley of the Kings; the unmistakable, stylized yet deeply expressive reliefs in ancient tombs and temples; and the the quiet surge of feluccas plying the Nile as they have for thousands of years. Journey through an Ancient Land also looks at the generations of explorers, treasure hunters, and archaeologists who, with not always honorable objectives, have searched, plundered, and studied Egypt’s past glories. As the search continues today, this book relates the latest findings of modern-day archaeologists who are charting ruined temples in cyberspace and recreating ancient Egypt with computer technology. Brian Fagan is an archeologist and popular lecturer in the UK. He is the author or editor of several books including The Science of Sacred Sites (1998) and The Oxford Companion to Archaeology (1996). Kenneth Garrett’s photographs have appeared in many books and magazines, including National Geographic Magazine andSmithsonian. DR. ZAHI HAWASS is the secretary general of Egypt’s Supreme Council of Antiquities and former director of the Pyramids. He is the author of many books, including The Valley of the Golden Mummies and Silent Images: Women in Pharaonic Egypt (AUC Press, 2000).